"A cranky old ghost who wants you off his lawn" That was the basic idea and I wanted a creature made of candy bars. The first issue I had to figure out was how to get AR to lock on a large structure. I tested a few different ways and ended up just increasing the scale of the object target. The target image is designed to scan in small objects like toys. I figured if I just increased the size of the target I could scan in a larger object. I made 4 different sizes of the target and ended up using the largest one shown here. The AR is triggered by the tin flower decoration on the front porch. I came up with the script with the help of my son and recorded the voice, basically yelling into a microphone. I put the audio file into Adobe Audition and added filters, changed pitch and speed. The animation was created in 3DS Max with a very low resolution character using morph targets for the mouth phonemes. Originally the character had big eyes, but the particle movement made the eyes hard to read, so i removed the eyes and used a bag of candy for the pupil. The pupils were originally bags of Doritos and Fritos, but the character says he's made of candy, so I changed them to bags of candy. The candy motion is derived from a particle system that sticks to the characters animation. Secondary motion was added by letting the velocity of the characters movement to add to the particle coordinates. Once everything looks OK, I had way too many particle to run in an AR project. I ended up attaching 3 or 4 candy bars together in a cluster and spun them around the group's center. This way I could reduce the particle count by about 3X. Then I tested, tested, and tested again to make sure everything would run smoothly and line up. 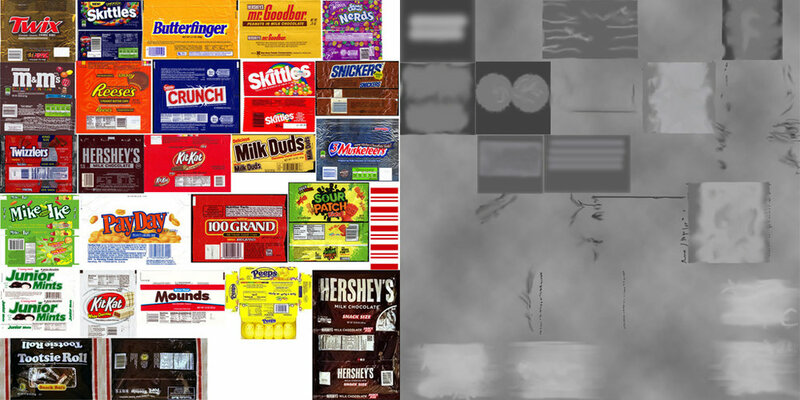 To keep a high frame rate, a simple texture was used with a normal map (derived from a grayscale bump map) and used on all teh candy bars. The wrappers and the bump map that was converted to a normal map in Unity.